A vintage style favor with a rustic twist. 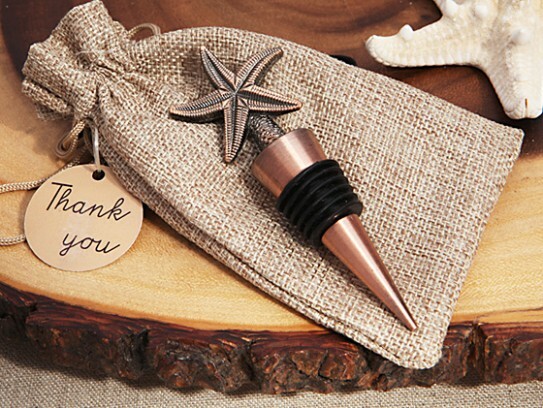 These vintage style copper finish metal Starfish bottle stoppers are sure to be appreciated by your guests. Each favor has a copper color metal Starfish design top attached to a copper design metal base and measures 4" long. Every time your guests sit down to enjoy their favorite vintage they will be reminded of your generous gift. Best of all they are ready for gift giving, they come packaged in a rustic burlap drawstring gift bag and come with a thank you tag.